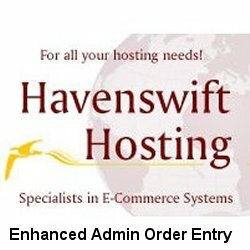 This Enhanced Admin Order Entry plugin greatly improves the process flow for adding new orders especially those added via telephone, in store or written orders and also when revising existing orders. This plugin requires no code edits to your store and is designed to work with CubeCart version 6.0.8 and later. See below for details about each enhancement and if you wish to purchase it, please click here to add it directly to your basket or alternatively click here to see our range of V6 plugins. Standard CubeCart functionality only allows you to type a shipping price into the “Shipping” input area when creating or updating an order but this module greatly improves shipping service selection. Once your customer details are defined within the Billing & Delivery tabs and the inventory has been added or amended, you can press the newly added “refresh” icon next to the shipping price box. After pressing the refresh button the module obtains a list of shipping services and prices from all of your enabled shipping modules and offers you to select the service you wish to use. The module always provides the option of free shipping as the first selection regardless of shipping modules enabled. Much like the shipping price, the addition of tax to an order has typically been a manual process however with this module the process has been greatly improved. The first thing to be aware of when using this module to add tax to your order is that you do not need to add multiple tax types / tax lines to get the correct tax price. You only need to select a single tax type from your available tax list. Selecting a tax type from the available list triggers the plugin to evaluate all of the inventory within the order. Each items tax is calculated based upon the tax class you have defined within the inventory configuration (Note, only applies to the Retail Pricing customer group). Once the tax has been calculated for all of the inventory the tax values are added together and the total tax value is added to the orders tax line. After the value is in the box you can press the add button as you would normally to add the tax line to the order. As the module calculates all of the tax based on the inventory level configuration, adding multiple tax lines is no longer required. When viewing an existing order a new line is added to the Shipping Information area found within the Overview tab. The total weight of the order is added in either KG or LBS based on your store configuration. The total weight is calculated based upon the inventory in the order and any selected product options. A new “Order Summary” print button has been added to existing orders and can be found under the Overview tab. This print button will allow you to print the entire contents of the “Overview” tab for your reference. A new “Proforma Invoice” print button has been added to existing orders and can be found under the Overview tab. This printed document is powered by a template which can be modified from within the “Enhanced Admin Order Entry” plugin under the “Proforma Invoice Template” tab. For your convenience a base template is made available with the module which you can modify or replace. You can use standard CubeCart smarty code within your template code. A new “Packing List” print button has been added to existing orders and can be found under the Overview tab. This printed document is powered by a template which can be modified from within the “Enhanced Admin Order Entry” plugin under the “Packing List Template” tab. For your convenience a base template is made available with the module which you can modify or replace. You can use standard CubeCart smarty code within your template code. The Print Invoice button, found under the Overview tab within an existing order has been improved. In a standard CubeCart store the template for the printed invoice is found in your admin skin files (/admin/skins/default/templates/orders.print.php). Many people use custom templates for their invoices which will often be overwritten when upgrading the store to a newer version. This plugin resolves this problem by making the printed invoice use the template defined within the module configuration. For your convenience a base template is made available with the module which you can modify or replace. The template can be modified from within the “Enhanced Admin Order Entry” plugin under the “Invoice Template” tab. If you already use a custom template for your invoice you can simply copy and paste the code from your template file into the “Invoice Template” tab within the module configuration. You can use standard CubeCart smarty code within your template code. Within the Enhanced Order Entry plugin configuration area you can find the delivery agents tab. This tab allows you to define your shipping service providers such as Royal Mail, UPS etc. The delivery agents are added to the order edit page as a list so you can choose the agent that will be shipping the goods to your customer. You can capture extra information about the delivery agents such as their name, phone number, website URL and any notes you may wish to share with your customer. Delivery agent information can be added to your email templates allowing you to send more detailed information to your customers. The website URL of the delivery agent as defined within the URL column of the delivery agents list. Any notes about the delivery agent that you wish to share with your customer as defined within the notes column of the delivery agents list.